This Brochure (1909) is from the Lakeside, a mountain resort in Eagles Mere, PA. 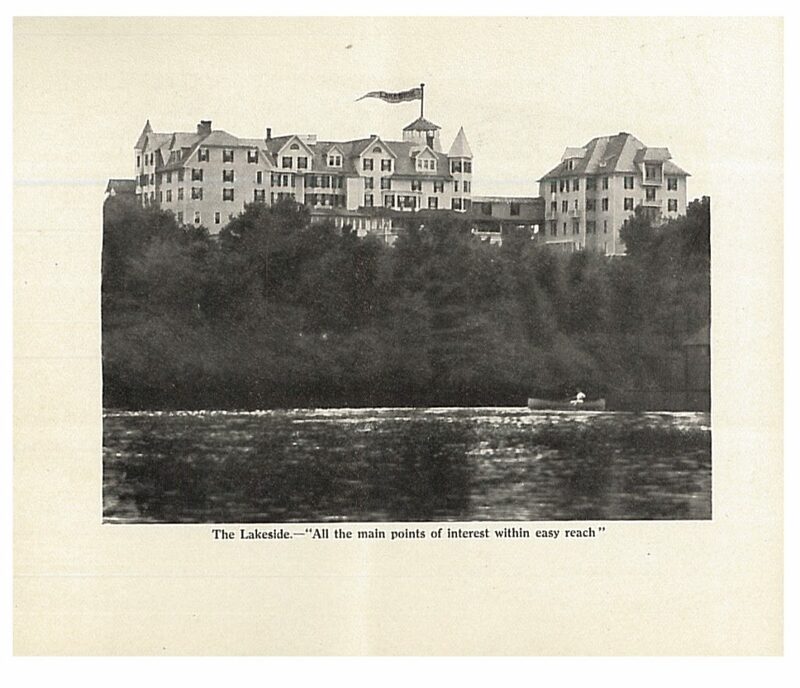 According to the brochure, the Lakeside began as a cottage in 1880 and was enlarged over the years so that by 1909, when this brochure was printed, it housed as many as 200 guests. The resort overlooked a lake about one mile long and half mile wide. Lakeside, Eagles Mere, PA. Brochure, 1909, a boat on the lake with Lakeside in the background. 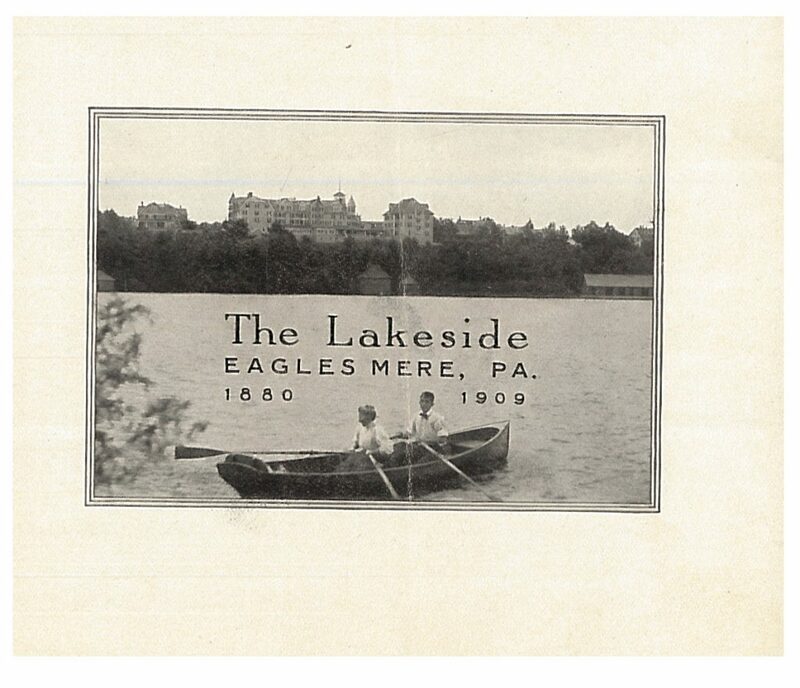 Lakeside, Eagles Mere, PA. Brochure, 1909, two people on a rowboat with Lakeside in the background. While vacationing, several outdoor activities were available to guests, especially because of the proximity to a lake. Walking paths gave visitors the opportunity to enjoy fresh air and appreciate wild flowers and the mountain scenery. Other activities included tennis on a clay court, golf at a nearby golf club, or boating on the lake. A path from the piazza led to the boat landing where rowboats were available, and every half hour, a steamer passed by. According to this brochure, there was even a fashionable time to be on the beach. The “fashionable hours” were from 11:00 am to 1:00 pm and 3:30 pm to 5:30 pm. 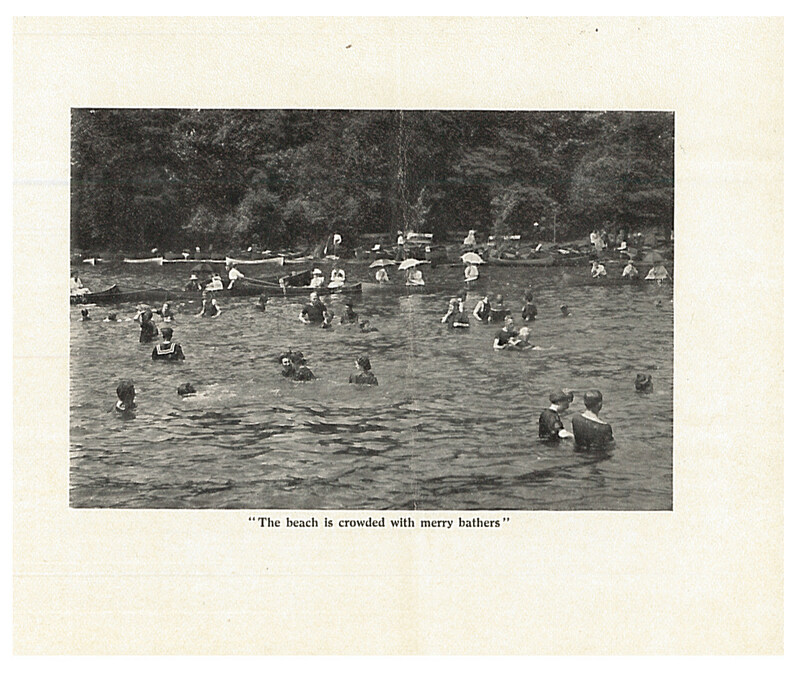 Lakeside, Eagles Mere, PA. Brochure, 1909, the beach at Lakeside. 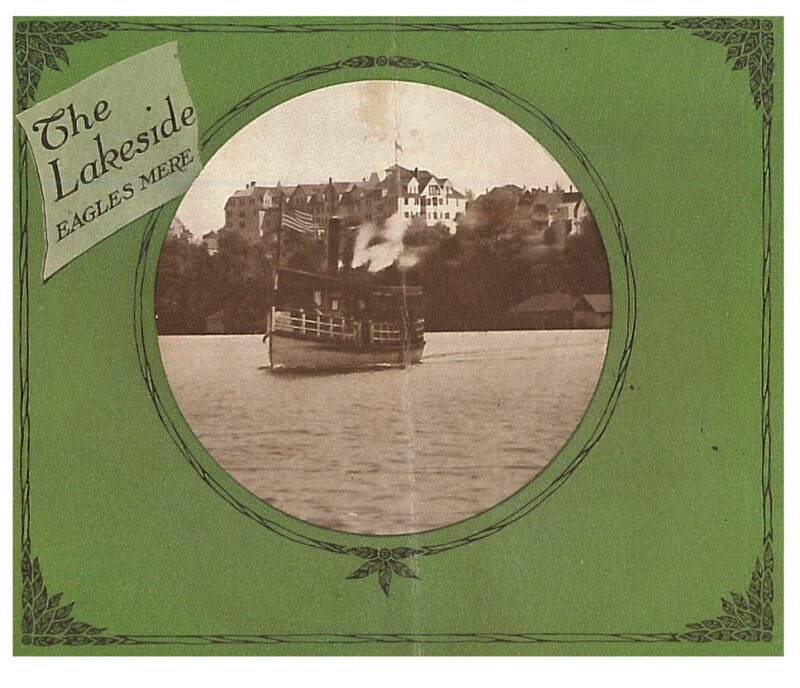 Lakeside, Eagles Mere, PA. Brochure, 1909, view of Lakeside. Back at the hotel, there were more amenities to enjoy. The Lakeside had wide porches on three sides of the building. Perhaps, it was a place to chat with other guests, enjoy the view of the lake, or relax in a chair and read a book borrowed from the resort’s circulating library. For sleeping accommodations, both singles and en suite, with private bath were available. At mealtime in the dining room, guests enjoyed a view of the lake, and for quieter moments, there was a fireplace and cozy chairs in the parlor. 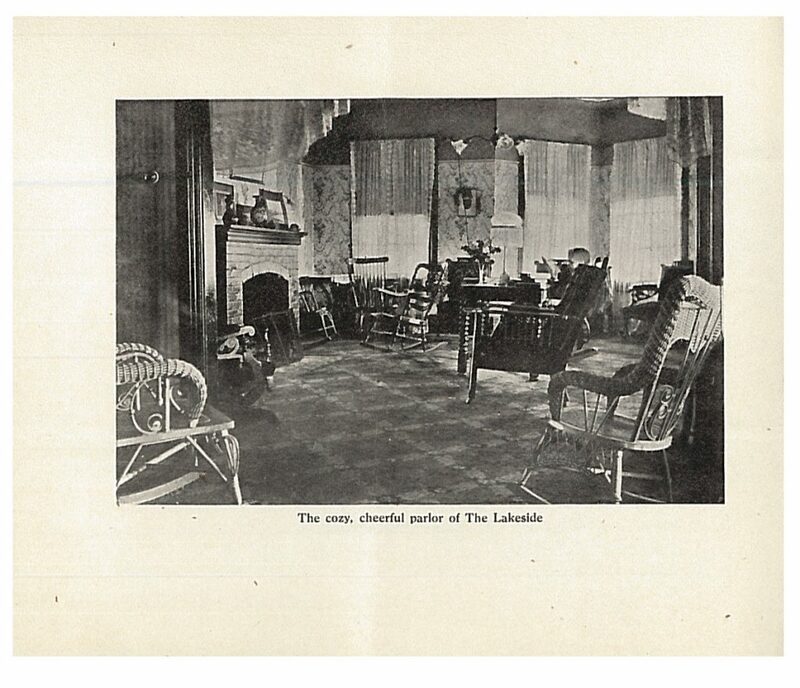 Lakeside, Eagles Mere, PA. Brochure, 1909, the parlor at Lakeside. This Brochure (1909) about the Lakeside is located in the Trade Literature Collection at the National Museum of American History Library.